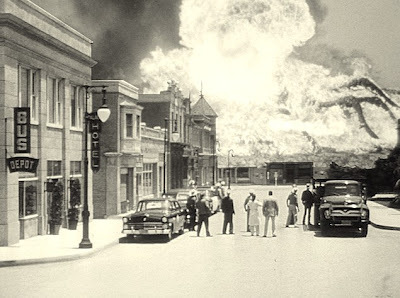 In the 1950’s the threat of atomic warfare was all too real. 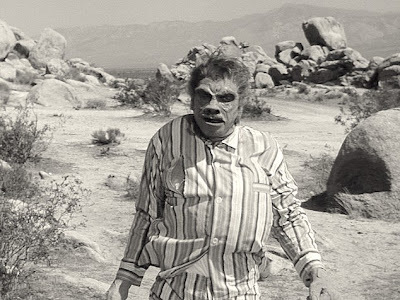 This caused a sense of uneasiness and downright fear in many folks, and as is often the case, the fears of the day were reflected on the silver screen. This rang true in the 50’s with tales of atomic mutations and science run amuck. 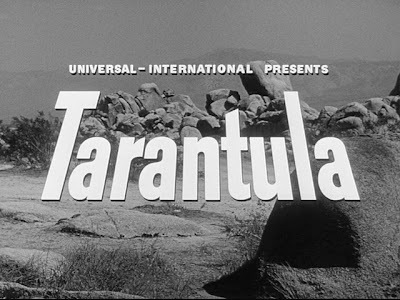 Perhaps the best example of this is the 1955 creature feature, TARANTULA. Directed by Jack Arnold, TARANTULA tells the story of a scientist named Professor Deemer, played by Leo G. Carroll, who, while perhaps a bit misguided, is not a mad scientist in the traditional sense. His intentions are purely altruistic – he is harnessing atomic power to create a serum containing a nutrient that causes animals to grow to gigantic proportions. Through this he hopes to solve the world’s growing food shortage – gigantic animals equal gigantic food sources, right? Now what’s mad about that? In the lab are several specimens which have been given this nutrient – among these are rabbits, rodents, and a tarantula. Not sure what food shortages would be solved with an oversized tarantula, but perhaps Deemer was just curious of the effects on insects. Ok, so maybe that’s a little mad. Unfortunately a couple of the researchers couldn’t leave well enough alone with animals and insects; they decided to try this nutrient on human subjects – themselves. This resulted in an advanced form of Acromegaly, a glandular disorder causing severe face and body disfigurations. This is the same disorder that actor Rondo Hatton suffered from. But the form of the disorder caused by this serum is a Super-Acromegaly, disfiguring the victim in a matter of days as severely as someone who had suffered this disorder a lifetime. Alright, we’re definitely veering into mad science territory now. When a severely disfigured man stumbles into town and collapses dead he is discovered by Sherriff Andrews, played by Nestor Paiva. 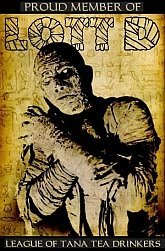 Nestor had previously worked with director Jack Arnold on the Universal classics CREATURE FROM THE BLACK LAGOON and REVENGE OF THE CREATURE. He recognizes the man as a town local, but just barely. His disfiguration is so severe he is almost unrecognizable. Sherriff Andrews turns to town doctor Matt Hastings, played by John Agar, for an explanation. Hastings is equally stumped and heads out to Deemer’s lab to find out what was going on there. He meets the doctor’s new assistant, “Steve” Clayton, played by Mara Corday, and the two begin to fall for one another. Mara would go on to star in a couple of other giant creature films in the 1950s. One has to wonder if perhaps the filmmakers were trying to duplicate the successful formula of this movie by casting her in those films. Both films were made, interestingly enough, in 1957, but couldn’t have been further apart in their effectiveness - THE GIANT CLAW and THE BLACK SCORPION. Mara sort of became the 50’s go-to girl for giant monster movies for a short while, before breaking back into mainstream movie roles. Meanwhile turns out all is not well back at the lab – Deemer is attacked and injected with the serum by a crazed, disfigured assistant, and in the scuffle the tarantula escapes its cage. It crawls out of the lab and into the desert where it grows to gigantic proportions. Local livestock begin disappearing, and Sherriff Andrews, Steve and Doc Hastings quickly put two and two together to add up to eight – legs that is. They attempt to stop the creature with dynamite to no effect before calling in the big guns – Clint Eastwood. In one of his earliest roles (his first being another Jack Arnold film, REVENGE OF THE CREATURE) Clint plays an Air Force squadron leader. The Air Force jets roar in and drop napalm on the rampaging creature just before it tramples the city – which is a shame, as I’d like to have seen a giant tarantula smashing buildings. 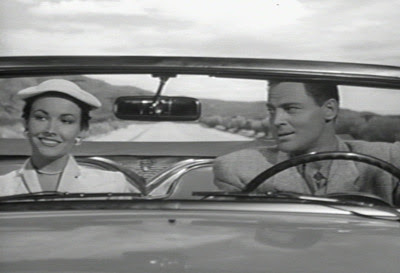 The day is saved and John Agar gets the girl, natch. The End. Arnold used a real tarantula and matting effects for much of the movie, using models for only the close up shots. 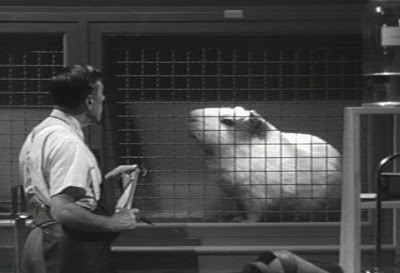 This worked really well, and the shots of the oversized animals in the cages at Deemer’s lab are especially convincing. 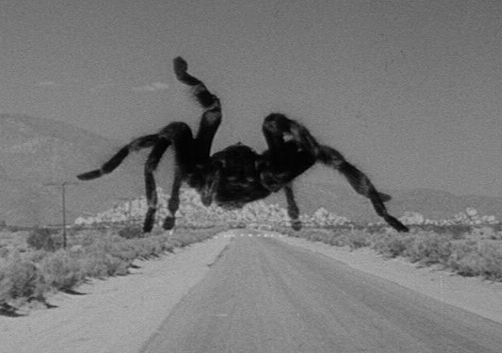 Arnold maintains a foreboding atmosphere throughout the movie, with the ever enlarging arachnid kept hidden off-screen for much of the film, skulking just behind a rock formation or scuttling about the desert in the dark. But when it does show up it has a striking impact. Arnold must have had a thing for spiders. 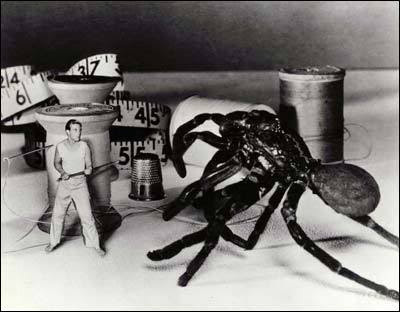 In 1957 he directed THE INCREDIBLE SHRINKING MAN and again used a spider to great effect. 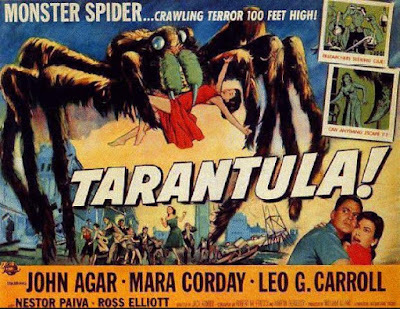 In this one instead of a spider growing to gigantic proportions the same effect is achieved in reverse – a man shrinks to tiny proportions and is attacked by a regular sized spider. 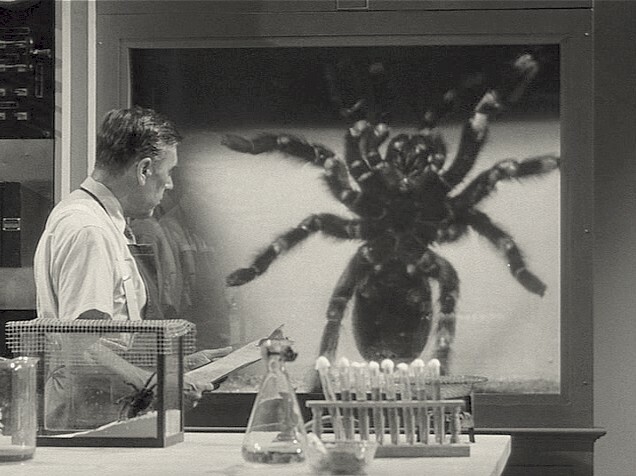 This is the high point of that film, and Arnold again used a real spider and matting effects for this scene, no doubt drawing on his experience in TARANTULA to shoot the spider scenes in that one. The crew on TARANTULA was top notch – the previously mentioned Director Jack Arnold, Producer William Alland (producer for CREATURE FROM THE BLACK LAGOON, REVENGE OF THE CREATURE, THE MOLE PEOPLE), makeup by Bud Westmore (THE MOLE PEOPLE, THE CREATURE WALKS AMONG US, ABBOTT AND COSTELLO MEET FRANKENSTEIN), cinematography by George Robinson (DRACULA’S DAUGHTER, FRANKENSTEIN MEETS THE WOLFMAN) and according to IMDB, tarantula puppet effects by Wah Chang (THE BLACK SCORPION - uncredited). The acting is all top notch in TARANTULA - John Agar was the perfect leading man, and Mara Corday a great leading lady, and their screen chemistry really worked well. 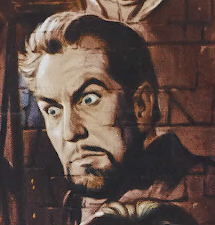 Nestor Paiva is one of the most memorable character actors of fifties cinema, and turns in another great performance here, as well as Leo G. Carroll as the scientist whose experiments run out of control. This film is the prototypical fifties science-fiction film and set a benchmark for other films to come. 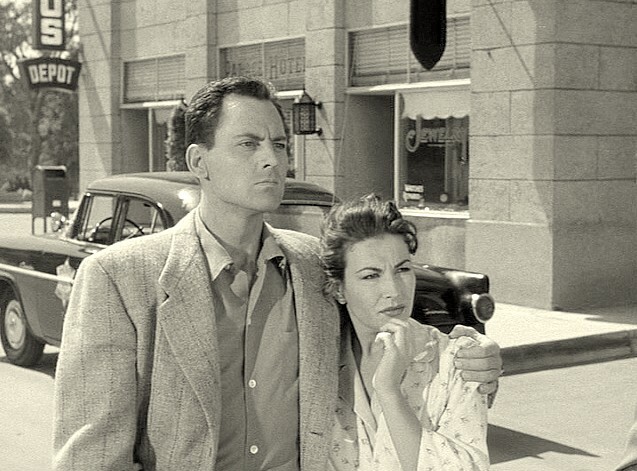 It has it all: a handsome leading man, beautiful leading lady, mad scientist, quirky sheriff, atomic radiation, mystery, murder, mayhem - plus Clint Eastwood and a giant tarantula – what more could a guy ask for? 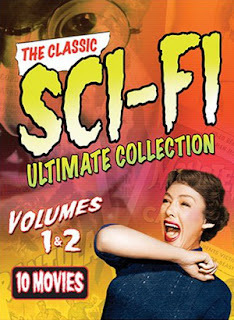 TARANTULA was finally released on DVD in the Universal Sci-fi Classics box set. I would still like to see it get a proper individual DVD release, complete with commentaries (perhaps with someone like Tom Weaver along with surviving cast or crew members) and documentaries on Jack Arnold and the making of this movie. Come on Universal, what are you waiting for? Stop repackaging the classic monster movies (which I LOVE but hell, how many copies of Frankenstein do I need?) and step into the atomic age! !